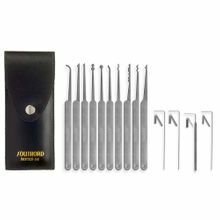 This 14 piece general purpose lock picking set is ideal for the novice as well as experienced practitioner. The Lock Pick Set comes with nine picks and a broken key extractor, all manufactured of tempered stainless steel and all with Southord's exclusive rivetless stainless steel handles, four tension tools and top grain leather snapover case. This lock picking set, when combined with the "Secrets of Lockpicking" book shown on this page, makes a great combo. Measures 5-1/2" X 2-1/4" closed.